RØDE is making wireless audio a hassle-free enterprise with the Wireless GO, a tiny, one-stop digital solution for recording and transmitting audio to cameras. This wireless solution will surely appeal to novices and pros alike, as both look for simplicity in the field. The TX is multifaceted. Clip it onto your lapel, and it works as a clip-on mic/transmitter, no external lav required for quick setup. 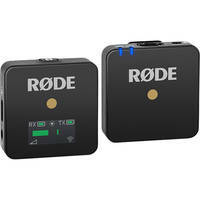 Thanks to its external input, just clip it to your belt and pair it with a RØDE Lavalier, and it’s a transmitter capable of sending broadcast-grade audio over 2.4 GHz digital to on-camera receivers. The onboard mic captures full-bodied, crystal-clear audio all by itself. Plug in an external mic, and the TX acts as a high-quality preamp and transmitter for that mic. The RX receiver has a TRS output, making connections with your DSLR or mirrorless camera a breeze. It can also be worn as a clip-on, should you need to don it as such. Both Wireless GO units are powered by built-in Lithium-Ion batteries that last up to seven hours on a full charge. Simply recharge them over USB whenever you need to. So, if you’re looking for a road to clear wireless audio with seamless digital transmission, check out the RØDE Wireless GO, now available online or at our SuperStore. RØDE is debuting this system at B&H’s booth at NAB 2019. I Like Rode mics, and have 4. I use Sony for my wireless mics in my video work. I believe that mics should be heard but not seen, and it looks like Rode is intent on making their wireless mic seen, no matter how you clip it on. Sorry, I don't want my videos to be advertising Rode microphones, so I won't be purchasing this system. If the back of the lapel clip had been a thin wire, concealing it would be easy... Or, put the mic element on a thin wire and the transmitter on the back of the clip so the transmitter can be concealed but the mic exposed... Am I missing something here? I guess I'm just not in the targeted demographics for this product. You can still plug in a lav mic, and use this as a standard wireless pack. It's only one option to go lav-less and use the pack as the mic.